Today was a slow day for me, as I'm still recovering from painting one side of the house and attending to various mowing tasks, so I potted on some lettuce and kale from the seeding flats and did dishes, then poured myself a glass of cider. The cider is mostly apple, with some grape, pear and quince in it, and has been a hit this year, with many requests for seconds. I've been keeping it in a two liter jug and adding quarts of juice from mason jars whenever the level falls. The fermentation has been ongoing since August. There is still a dark area on the kitchen ceiling from a time last fall when I opened the jug too carelessly. As I was about to quaff the golden bubbly, a thought occurred to me. We have been intrigued by the probably very ancient practice, briefly described in an episode of Edwardian Farm, of singing or reciting poetry to the trees in the orchard, and offering them a small libation. It tends to be a Decemberish thing to do, and there is a Christmas carol that seems to date from the slow transition from "wassailing" to "caroling." But what harm could there be in offering, on the last day of February, a bit of thanks and a word of caution to the young trees, some of whom have bloomed already in this winterless winter we've been having? ...or words to that effect. I admit I was a little shy and may have mumbled some of it. ... and a peach that has bloomed, poor thing, well ahead of any bees that I can see. There's a big hatch of flies on, so maybe something will come and visit the peaches later in the week. The hens took considerable interest in the proceedings, so I offered to sing to them as well. All well and good, thanks, ma'am, but perhaps a little comfrey and cleavers for dessert? So I obliged. I'm a veg gardener and orchardist. Beloved is the stock owner and does all the animal chores here; but when she is away I fill in. Her system is simplicity itself. Let everyone out in the morning and gather duck eggs. Check food and drinking water and replace as needed. Later in the day, gather chicken eggs and wash any (mainly duck) eggs that got dirty, then put away in the cooler. Clean out and refill the duck pools twice a week. Replace the bedding as needed, hauling the enriched straw to the compost heap. Just after dark, close everybody in. The young man often does the duck pools and bedding for us, which at our age are getting to be real chores. As we are on a small well, we have to conserve water and so he carries five gallons of the duck slurry to each fruit tree in the dry season. I keep a stock tank in the duck-bathing zone and let duck water ripen there, with added blender-rendered comfrey and weeds poured in, to further enrich the slurry. It's too strong to go straight on the kitchen garden, though I have thought of putting a few hole punched number ten cans in the ground in the tomato beds, and pouring it in there. Beloved and I squabble over kitchen scraps. I tend to put it all in the compost heaps, but she likes to save out the best stuff to carry to the barnyard. She'll put the trimmings from the broccoli on the end of the counter, give me a significant look, and say "This is for the birds." You don't miss your frost till there isn't any. Coming into the last week of February, we had had all of six, maybe seven frosty mornings total, which does not bode well for tree fruits, so we were happy to see four mornings in a row with rime on the gates and crunchy grass. I had to kick the water buckets to shatter a skein of glass-like ice for the poultry -- a satisfying feeling. We're not out of the woods but anything helps. I have half a mind to rap the trunks of the trees with a stick, then drink to them with their cider and sing them a little song. Every twig, apples big. Every bough, apples now. In spite of the cold starts the days warmed up to around 60F and so I determined to get some painting done. I'm, alas, a splashy painter, so I wrap up in anything from the rag bin that fits to splash on as I work. The south wall of the house gets the most weather and the boards warp and shrink away from each other, letting those long "pineapple express" storm winds infiltrate. So I caulk as I go, brushing the paint onto the caulk and pushing deeper into the cracks. As I dab at the house, a bald eagle soars past, perhaps patrolling for mice and voles who are also active in this weather. It may not be spring but the spring things have sprung. A glimpse of the chicken moat (currently ducks only). Conditions are very droughty, so we are doing the summer routine of carrying a bucket of water from changing out the duck pools to each fruit tree -- labor intensive, but the water does not pump well when full of duck "snortle" and we just can't pass it up. In summer we run comfrey and weeds through a blender (not used for food) and add the green slurry to a tubful of "duck water" to give the trees and gardens a boost. There are two new plum trees this week so we are making sure they get two buckets each. The little tree in the netting tube is a pawpaw, which are said to be hard to do here. I'll be keeping an eye on it. 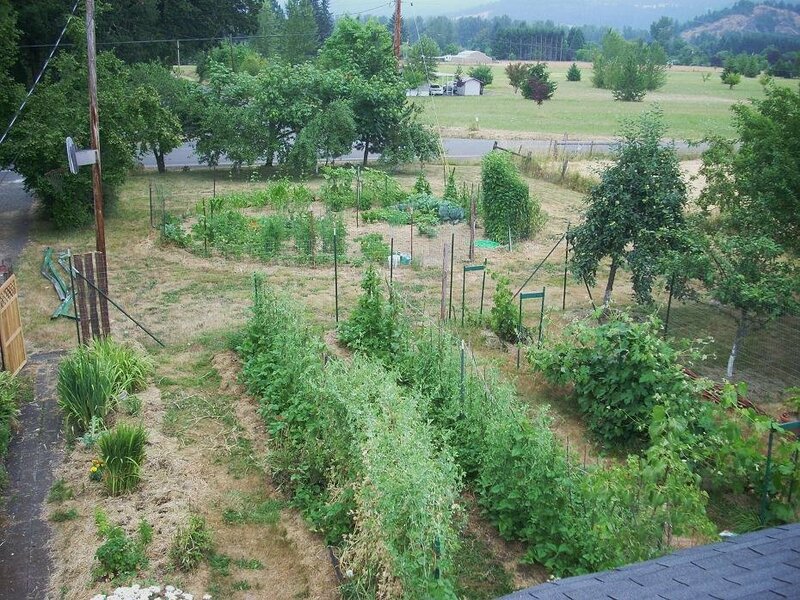 Deer fence is at left on the property line; across the garden fence at right is the garden, with a raspberry patch along the fence. Bed making is ongoing, as I'm good for at most two a day. This is not what permies expect to see in a garden, but for reasons we have to keep this area mostly free of perennials, so it's treated as a rather traditional veg garden, with some polyculture, such as Three Sisters. ...then rake out the paths. Although the paths and beds are the same width as measured when made, the beds tend to crumble into the paths a bit, which is fine; the rake will establish the actual width of the path with one pass. Now, and not until this is done, do we really know the size of the beds and paths, with the beds slightly wider. It's great when your tools can establish the sizes and distances; one goes back and forth much less when doing maintenance, and the soil will thank you for that. In this winter which, unlike that of some other people, where whole shopping malls are collapsing in the snow, we not only have dandelions and daisies up and birds nesting, but rain that should be falling and isn't. Meteorologists talk about the California drought, but half of western Oregon is in the zone, and we're feeling it. So here I am watering the garden. There's not much out there, just three rows of broadbeans and half a bed of peas, but they need water to get started, so I have gotten out the hoses, replaced a couple of washers, connected it all together, and begun the irrigation year. Bit of a shock. I also had broadbeans in front of the house, but I'm competing with the dog for that space -- it's where he likes to hide bones. So I've replanted and then upended the sieves over the beds for protection. In the greenhouse there is the merest hint of green. I've potted on a few things from the flats, which was silly of me as they're not really big enough, but some part of me is impatient this year. I think I'm becoming afraid that my skills will turn out to be for nought -- that the climate will reach the point, in my lifetime, when nothing can really be done on farms and in gardens any more, except in sealed (and guarded) environments, and starvation sets in. That's not so bad for me, as I've had a good run, but then a picture of the grandchildren appears in my mind. I do feel I've let them down. But a friend reminds me we've really been in overshoot for over four thousand years. So, like, he's saying it's hardly my fault. What I'm feeling is, he adds, mostly liberal angst. "You'll get over it once it sinks in that all the prepping you've been doing will only give you, on the outside, about two years. And if you bring the kids home, half that. And if you bring the grandkids, half that." He chuckles. I answer, "well, that wouldn't stop me. But your figures are wrong. I was raised a certain way, and so were my kids." "The grandkids would live two years." "Oh. Yeah. Same here, actually." "Yes. That's why you're my friend." And we look at the greenhouse together in silence. Yesterday, I set poles for peas. They aren't exactly peasbrush, but they are shorter than beanpoles, usually do the job and are easy to take down and re-use. If the peas have trouble finding them I can add string or enough twigs to get the ball rolling. I plant peas, beans and corn standing up (old body). The pipe shown is aluminum, bent at one end, a bit of salvage from an old umbrella tent. Drag the pipe toward you, so that it sinks into the ground a bit, then drop the seed down the pipe, then bash around a bit to cover the seed. Skip a few inches and repeat. Here's a shot from five years ago, when I was using a PVC pipe. They're all right, but I became aware that I was abrading the plastic into the soil, and that the tiny bits migrate from the garden to the creek to the river to the ocean, which they are killing, so I switched out. That's at least as easy as not caring and it doesn't matter if it's a futile gesture. The pole beans will get taller poles and the trellis will need a bit tighter construction as beans tend to pull flaky trellises down. I want to trellis cukes too, something on my bucket list. Here are some garden trellises from old posts on this blog. In this heavy clay the broadfork does not sink far. I step on on side of the bar and then the other, or even climb on and dance. Eight inches of penetration is better than none. The little dangling thing is my neck knife, which will come in handy tying up the beanpoles later. I lean on the handles to lift the soil in the bed. It also helps to pull towards me a bit, rocking the forkful out of its original position some. 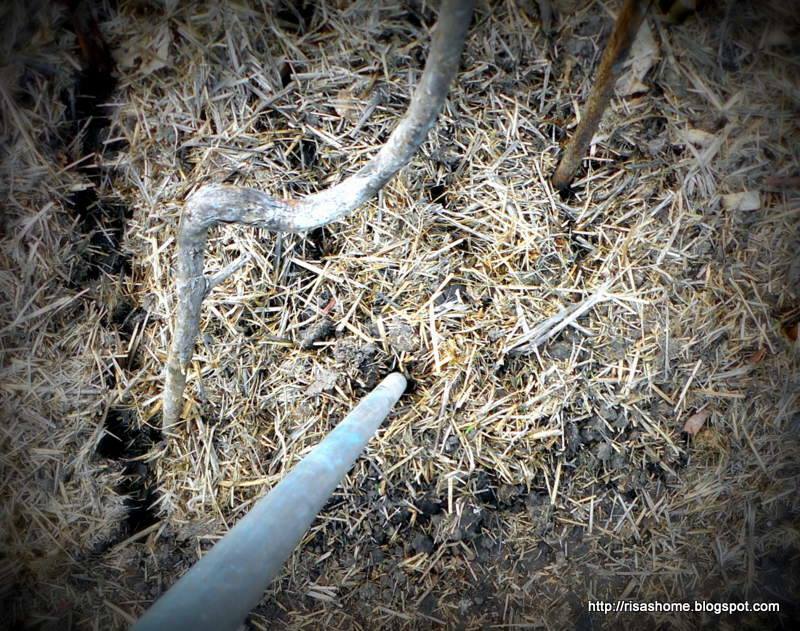 It's not as much soil disturbance as plowing or tilling and can be done in wet soils, an advantage in clay. Fifty feet in less than an hour! In loam it would go even faster. The bed is now lifted about two inches. It's fifty feet long because that is the length of the usual soaker hose. With a hoe, I pull even more soil out of what will be the paths, raising the bed another inch or two. No need for built sides. This bed could easily be next year's path, a form of fallowing. Half of the bed will be dedicated to peas, the other half to green beans and runner beans. Tomorrow I hope to come back through here with a lot of sugar snap peas (from Fedco). With these narrower beds, there will be room for seven beds between the blueberry bed and the raspberry bed. In the three beds in the upper garden, there is now a row of broadbean seeds down the middle of each one. It is hoped these will supply some much needed nitrogen to the mixed greens, which are coming up in flats in the greenhouse. Introduced the annual composts (both sheet and pile including, in the latter, the year-old humanure) to the top two inches of the soil in the lower, north end of the garden. As I am old I do this with an electric cultivator. This is not tilling; the deep soil is too wet and I dislike destroying the structure. Will come back later with the broadfork to shape and loosen the beds, as was done in the upper part a few weeks ago. The white bits you can see are mostly eggshells. I should dry and crumble them before they go on the garden but just don't have the oomph. The grapes at right, as you can see, have gotten out of hand. Well, that happened 22 years ago; I'm not up for making them look like the ones on the wine estates and they have always produced more than I can use anyway. So what I do is knock them back with hedge clippers, which is why you can see the ground littered with gravevine bits there. I'm keenly aware that my style of gardening is not really sustainable; the way to prevent such behavior by old-timers is to convert us into soylent green. Meanwhile, I hope to grow better veg than they have on offer at Walmart. That is all. This area is in mostly grass because of well-and-septic issues, as well as flooding. It's very near the seasonal creek. The wellhouse is to the left and you can see the hot water pre-heater leaning against it in a kind of cold frame. There is a salvaged hot water heater lying in there, with the pop valve on top, jacket and insulation peeled off half, painted black. When we run hot water from the electric water heater (a superinsulated model paid for by the utility co-op), it fills from the solar tank, cutting down on the electric load. Yes, the fir tree is too close to the house. It will grow a few more years, then be cut down. All along the walls there, hops roots are sleeping in the earth. They will shade the house in summer, trellised on string from the roof edge. I don't do much beer but it makes a nice bedtime tea. Also produced in this part of the yard: blackberries, cherries, elephant garlic, quince, filberts, comfrey, butternut, firewood, and camping. It's time (early this year, I know, but the ladybugs have hatched and the peach trees are budding) to close out the ducks for a bit and spread the compost. First I open the bins and fork out the contents into the wheelbarrow and dump around the garden. ... and spread them around even further with the leaf rake. A quick look with the thermometer tells me it's 43F in the lower garden and 44F in the upper one. Iffy for peas, so I think I will put them in flats for now and set them out later. The Young Man is visiting and after helping me clear away prunings, cleaned out the barn. The bedding forms the base of the new compost heap. Grass clippings will be added in the next week or so. We use humanure, by the way, but it spends a month in the composting privy, then ten months in the composting barrel. It's not combined with the open heap until January and reaches the garden in February, a year after "deposit." Red worms have doubled in the resulting mix over what we have seen in pre-humanure days. The little white dots there are bird poo; a towhee got into the greehouse while I was away and panicked, tearing up my flats of greens and pooing everywhere. Then a week later it happened again. Same one? Putting up the flats in the sun and watering them in. High hopes for a productive year but concerned. We have been having this shirt-sleeve weather since December.